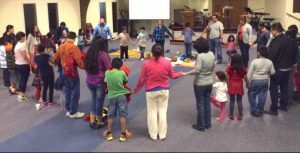 Can the Church of Clark County reflect heaven by covering the county in continuous worship and prayer? If we coordinate, the answer is YES! Clark County Prays is a way we can coordinate. They will rally the people in their congregation/ministry to cover the entire 24 hours in prayer each month in a way that fits their congregation/ministry. When we have 35 congregations/ministries, we can cover the all the days of each month. We suggest four primary prayer segments be included in the prayer times.- 1) Worship of Jesus 2) Topics unique to your congregation/ministry 3) A common topic each month for Clark County 4) A designated unreached people group. CCPC will provide fresh suggested ways to worship each month. Your congregation/ministry leader will provide topics of prayer for your congregation/ministry and information about the unreached people group each month. CCPC will provide monthly topics from and for the county.